Here, our wolf-guide—sometimes wearing a lab coat and stethoscope, sometimes sporting a chef’s toque, sometimes waving a pointer—takes young readers on a tour of the human body from the inside, pointing out and explaining the bodily processes that transform food into poop. Lafrance’s hilarious pastel illustrations—on a bright palette of mostly yellows, reds, greens and, um, browns—complement Delaunois’ kid-friendly scientific text that even contains the sound effects of digestion! Zolinsky’s Spanish—sometimes placed above and sometimes placed below the English—is a hoot as well. And now, for the evaluation. Maribel: “I think this book is good because you learn about things you didn’t know like how your body actually turns food into poop. For example, you eat something and maybe a few days later it comes out and stinks because it’s been up in your body for days and all the good stuff has been sucked out and used. Poop is what your body doesn’t need. “I think the drawings are very good because young children can look at them and see what’s in their bodies. I like the pictures of Chef Wolf—he’s leading the story like a teacher and a guide leading you on your journey. For instance, he’s in the stomach and he’s got scuba gear, and he’s grocery shopping in the intestines while the blood and organs take what they need. Amelia: “I like to look at this kind of book because it has information to read and the pictures show me what’s next. 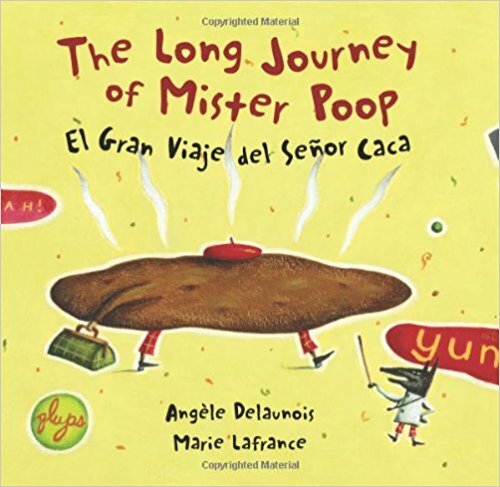 Judy: The Long Journey of Mister Poop / El Gran Viaje del Señor Caca is highly recommended. Maribel: El Gran Viaje del Señor Caca is highly recommended. 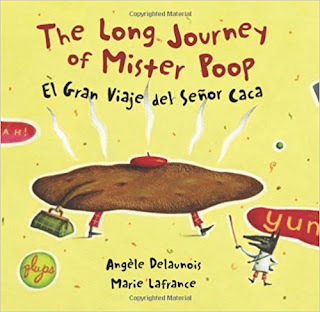 Amelia: The Long Journey of Mister Poop is highly recommended. We’re all disappointed that this excellent, funny book is currently out of print, and encourage the publisher to bring it back!